The CollegeDay crew said that the Knights defense will play a critical role in tonights game. Knight News got the chance to speak with Lee Corso, Desmond Howard and Rece Davis. While the three had conflicting views on whether the undefeated Knights’ defense will be effective against the Cincinnati Bearcats, they all said they’d be watching that side of the ball. Corso and Howard commended the way the Knights have been playing defense this year despite the amount of yards and points they have given up.”They play really good defense'” said Howard. The two even gave credit to Randy Shannon in what he has done in his first year here as the defensive coordinator. The key take away from what the two said was going to be the Knights ability force turnovers. While Corso and Howard think the Knights defense is fine, Davis thinks the Knights run defensive could cause them to struggle. “While UCF has been taking the ball away, they haven’t been this staunches defense in stoping the run,” said Davis. 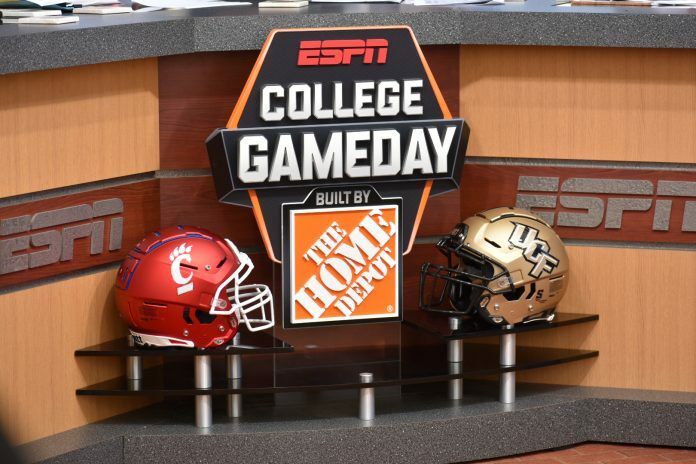 The overall consensus from all three was that UCF will come away with the win, but it will not be an easy one, especially if the Knights defense doesn’t come to play.